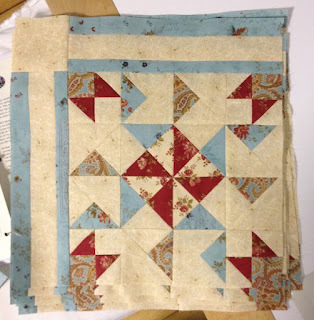 Quilting Adventures: Mojo's back ....! I've been playing with fabric! Sewing the pieces back together into these. Ohhh, I do like how it's turning out. The colours are so rich! I started that project December 9, 2014 ... put it aside to take care of other stuff .... then I lost my mojo. That is going to be beautiful, I think I have some colors like that. So glad it is back! Those blocks are beautiful. Ohhh I'm with you! Loving this too! Virtue of a fabric stash...! Pillow fight .... in style!